It’s quite a different sound, right ? If you want to hear how other songs sound when switched from major to minor, starting today, all 12000+ songs in Hooktheory’s Theorytab Library can now be played back in any key or mode. 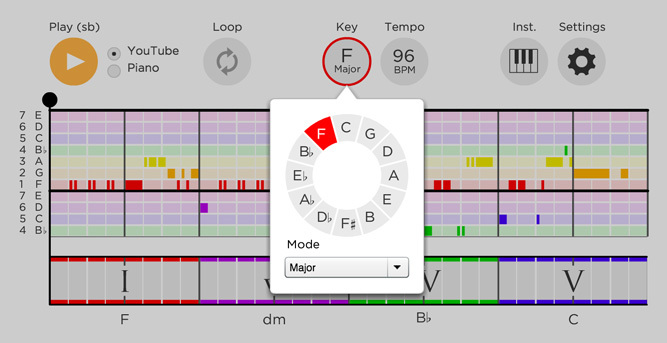 Theorytabs are tabs that show the theory behind popular songs; they remove the details of instrumentation/arrangement, allowing you to hear and understand the pure chords and melody that make up a song. Before you explore the library on your own, we’ve curated a couple cool examples for you. Click play below to see and hear how the chords and melody change when “Blank Space” is transposed to minor. Now listen to how it sounds in the dorian mode. Some songs sound amazing in different different keys/modes, while others… not so much. Explore the Theorytab library to find the ones that sounds that best and let us know what you find!